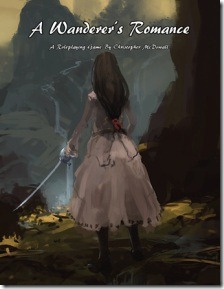 SoogaGames and Stargazer Games are proud to announce that Christopher McDowall’s game “A Wanderer’s Romance” is finally available for free from DriveThruRPG. So what’s this game about? The world began as nothing but ocean. The Origins raised up a million colourful islands, anything larger than a few dozen miles being swallowed by the envious deep. Some of these immaterial beings chose to take a physical form and live in the varied lands they had created, eventually settling into the forms of men and beasts. Our ancestors. The Origins that did not take physical form paid a great cost. They were left unable to affect their world directly, relying upon influencing men with words and knowledge. Their teachings led to our understanding of elemental balance, the formation of the thousand Legendary Styles and the universal code of combat that define our world today. You are a great man or woman. An errant trained in both the noble art of combat and in contests of body and mind. Drifting from one island to another, you have your own philosophy on life and the power to enforce it. A Wanderer’s Romance is a game of martial art duels and tea-making contests set in a world of unnatural islands on an endless sea. It draws on its Wuxia influences but focuses on a character driven game with scope for incredible environments and a true sense of exploration. A fast, simple and easy to learn system for task resolution that spreads consistently across duels, contests, activities and group tests. Dozens of combat styles for characters to learn as well as countless other types of contest they can specialise in. A setting outline designed for maximum creative freedom. Every group’s world will be different but will share in similar themes. Multiple ways to support your allies from teaching them lessons in defeat and envigorating them through activities to training them in combat styles and preparing tea and food that will balance their elemental forces. By the way, the beautiful artwork in the game was created by Pavel Elagin and was used with permission. Check out his portfolio for more examples of his art!